Residents have criticised a "crass and offensive" survey asking them to rate how important the Grenfell Tower tragedy was to them. The questionnaire sent out by a Kensington branch of the Conservative Party asked for people's views on the fatal fire alongside issues such as parking and recycling. Labour MP David Lammy described the survey as "deeply troubling". The Tory group have been contacted for comment. The leaflet, which seeks to find out what kind of issues are important to residents ahead of the 2018 local elections, was sent out to households in the Courtfield ward - a wealthy neighbourhood in Kensington. The questionnaire, which is also available online, asks people to rate "how important to you and your family" the disaster and other "local issues" were from "0 - not important at all" to "10 - very important". Charlie Goodman, 34, who lives in the area, said the Tory group should apologise. "I think they have acted in a very insensitive manner," he said. "It's not something one would ever want to quantify, particularly when you consider the other items on the list. "I would have to rank it at least 100 and make everything else one." Luke Francis, who lives near Grenfell Tower, posted a picture of the survey on Twitter and had his post re-tweeted more than 4,000 times. He said: "It went viral. It's been seen more than half a million times now. "Everyone was equally staggered that anyone could be so crass and insensitive. It's just phenomenal. "Someone needs to come out and apologise." 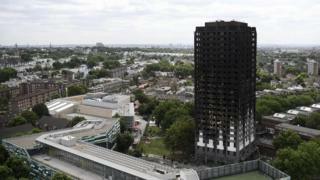 Labour MP David Lammy, who lost a close friend in the fire, said the survey was "offensive and insensitive". He added: "The Grenfell Inquiry has barely got under way and the same group of politicians who have been in charge of the Royal Borough of Kensington and Chelsea appear to be already brushing what happened under the carpet. "There should be apologies and the individuals involved should certainly be considering their positions. I simply cannot understand how this was allowed to happen." The Kensington, Chelsea and Fulham Conservatives are yet to respond to requests for comment.